Our professional facilitator will arrive at your school with a pop-up theatre experience. The workshop is packed full of information and fun. Meet an Elizabeth to find out the gossip in the palace about Henry VIII wives and why Elizabeth I never married. Theatre Workshop has been touring schools for 25 years. 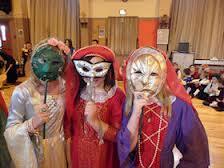 Our experienced facilitator will visit your school with this unique Tudor experience. With our fabulous pop up theatre, to create the atmosphere, the actor will guide the audience through the history of the Tudors. How did Catherine Parr out live Henry VIII, what happened to his other five wives?. Why was Queen Elizabeth I so popular & what is a potato? All will be answered in the workshop. Your pupils will be acting out being Henry VIII, Anne Boleyn losing her head, and if that’s not enough, a royal visit from Queen Elizabeth I. The workshop is presented in your school hall and will have the audience smiling and enthralled. Each session is tailored to fit your school day. Sessions last a morning or an afternoon. Can accommodate three sessions in a day.